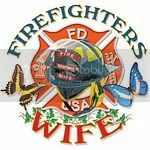 this group was designed for us woman who have a husband and or boyfriend in the fire service!!! COME ON LADIES JOIN ME IN STANDING BY OUR MEN AS THEY RISK THEIR LIVES!!! !LETS SHOW THE WORLD WHO THE REAL HEROS ARE!! You have a firewife blog? You need to be a member of firefighters wives to add comments! Please add me on facebook, I neglect my FFN page but update so often on facebook: facebook.com/alexis.d.hughes would love to keep up with everyone!! Wow!!! Congratulations Dee! You're right there have been a lot of changes since you joined. I never did log on and welcome you before, so let me say now...Welcome to our group. Congratulations on your recent marriage, your promotion and keeping it all together when times are hectic. At least it's a good kind of busy, right? Hi Ladies! I know we had talked a while back about blogging for firefighter's wives. Everyone, especially the ones without the on-shift interaction and venting time with other adults, could use someplace to turn to for advice, humor, shoulders to cry on, etc. Firehouse.com has asked me to become an official blogger for them in order to reach out to you ladies and the many other women out there who love this firefighting life too! I have posted three blogs now, but I don't think many of the guys are sharing with their wives that there is now something for them on there too. So, if you feel like coming together and laughing a little at what we ALL know we go through everyday, please check them out on Firehouse.com under Official Blogs. Also, please feel free to register and comment. It's not a website just for the guys, but I don't think I've had one comment from any wives. I value your opinions though and, aside from myself and my family, it is the wives that I love to write for the most. Oh me, too!! I am the one who listens to sports radio, non-stop, my twitter is filled with my sports addiction, I am so horribly competitive that I find myself having to remind myself that I am the grown up. BUT, I LOVE my toys - my Garmin, my Nook, my phone - lol I am a geek!! Val - it is nice to put a name with a site, it was actually your site that caused me to think, "maybe that is not such a bad idea" . It is a small world. Thanks Val! !